With the theatre that is politics gearing up for the equivalent of the BAFTA awards, a.k.a the general election, ‘Land Bankers’ looks all set to receive top billing at Westminster. Starring the usual cast of our favourite characters - greed, avarice, immorality and heartlessness - ‘Land Bankers’ follow the traditional west end plot. The kingdom has a housing shortage - the worst in living memory. According to the Institute for Public Policy Research, there will be a shortfall of 750,000 homes by 2025. The kingdom also has a villain. Not just one but a whole bunch of them. The villains are sitting on 400,000 plots - all with planning permission for houses. That’s 400,000 homes that could be built right now. If that happened and there is no reason why it shouldn’t, because they all have planning permission, those new builds would solve the housing shortage in one fell swoop. Building those houses would support 600,000 jobs in construction and create 10,000 new apprenticeships. Our hero, a man of the people, has made it plain that he is going to do the right thing for the hard working people and families of the country. And he has a plan. A decree will be passed that henceforth local authorities throughout the land will be given the power to penalise those housebuilders and developers who have planning permission and refuse to build houses. Once this happens the people of the land will be able to sleep happily ever after - in houses. Throw in a catch phrase, ‘use it or lose it,’ the equivalent of he’s behind you, and there you have it, a vote winner if ever there was. Of course like most story lines this one is not without its plot-holes. Of the 400,000 houses identified as having planning permission, many only have outline planning permission,* while others are on privately owned land. Buying land takes time. Meeting the myriad technical challenges and the local authorities regulations, takes time. Of the 400,000 houses quoted a significant number are already being built. And finally, and this is one of those technical points that really shouldn’t get in the way of any good story: there have been three independent enquiries into land banking since 2004 all concluding that builders and developers ‘do not’ hold onto land in order to manage the market. 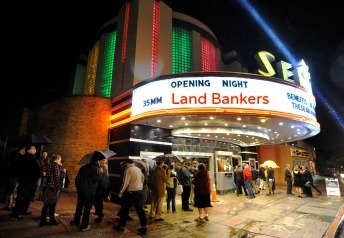 Land Bankers has some gaping plot-holes but then this is classic British Westminster theatre. * According to Taylor Wimpey’s CEO, there are approximately 100,000 new builds which fall into this category.